Located in Cotai, Hotel Okura Macau is a perfect starting point from which to explore Macau. Featuring a complete list of amenities, guests will find their stay at the property a comfortable one. To be found at the hotel are free Wi-Fi in all rooms, casino, 24-hour front desk, 24-hour room service, facilities for disabled guests. All rooms are designed and decorated to make guests feel right at home, and some rooms come with television LCD/plasma screen, internet access - wireless (complimentary), whirlpool bathtub, non smoking rooms, air conditioning. To enhance guests' stay, the hotel offers recreational facilities such as hot tub, private beach, fitness center, sauna, outdoor pool. 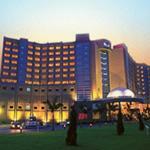 Hotel Okura Macau is an excellent choice from which to explore Macau or to simply relax and rejuvenate.